Major A. A. 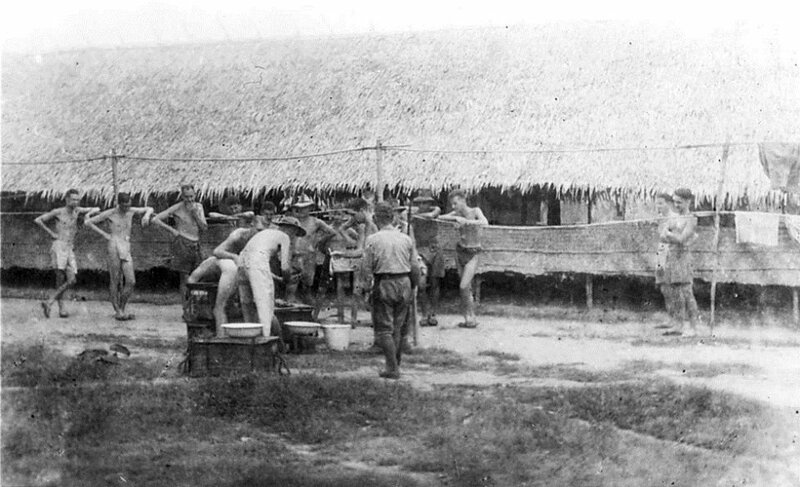 Moon performing a haemorrhoid operation at the Regimental Aid Post at Tamuang POW Camp. The guard in the foreground, back to the camera and supervising the proceedings, was known as Bombay Duck, 1944. Image courtesy of Arthur Moon, State Library of Victoria. The first two defendants, Kishio Usuki and Aitaro Hiramatsu, were Japanese officers and, at different points in time, held the commanding position of various POW camps while the remaining defendants were Korean Guards serving in the camps. The defendants were charged for ill-treatment of POWs, including beatings, depriving them of food and medicine and forcing the sick to work. Tha POW camps involved in this case were Tamuano, Kanu, Tarsoa, Pratchai, Tonchan, Rin Tin, Pungyisho, Kinsayo, and Krian Kri POW camps. Usuki, Kishio. Lieutenant. From Japanese military. From Japan. Guilty. Death by hanging. Sentence confirmed. Hiramatsu, Aitaro. Sergeant Major. From Japanese military. From Japan. Guilty. Death by hanging. Sentence confirmed. Motoyama, Kinzo. Korean Guard. From Japanese military. From Korea. Guilty. Death by hanging. Sentence reduced. Life imprisonment. Matsumoto, Meizan. Korean Guard. From Japanese military. From Korea. Guilty. Life imprisonment. Sentence confirmed. Tokuyama, Mitsui. Korean Guard. From Japanese military. From Korea. Guilty. Death by hanging. Sentence reduced. Life imprisonment. Iwaya, Taikyo. Korean Guard. From Japanese military. From Korea. Guilty. Death by hanging. Sentence confirmed. Tomotoma, Yugei. Korean Guard. From Japanese military. From Korea. Guilty. 10 years' imprisonment. Sentence confirmed. Morimoto, Kinei. Korean Guard. From Japanese military. From Korea. Guilty. Life imprisonment. Sentence confirmed. Minaka, Shunshaku. Korean Guard. From Japanese military. From Korea. Guilty. Life imprisonment. Sentence confirmed. Kumoi, Eiji. Korean Guard. From Japanese military. From Korea. Guilty. 15 years' imprisonment. Sentence confirmed. Blacklock, E. W. Lieutenant Colonel. From British military. Court president. Solicitor. Hodgens, S. F. Major. From Australian military. Partington, D. W. M. Flight Lieutenant. From British military. Hibbert, A. A. Major. From Australian military. Law student. McIntyre, Grant. Captain. From Australian military. Fortescue. Major. From British military.